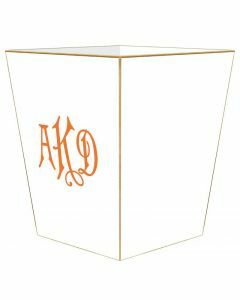 This Rose Stripe Wastebasket comes in three different styles and can be personalized with your monogram or custom text. Text layout and line breaks are made at the artist's discretion unless otherwise is noted. Proof will be emailed upon request. Please respond promptly to avoid delay. 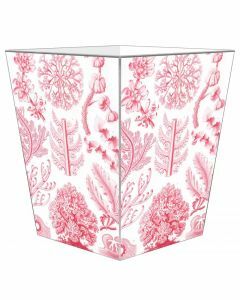 There are three different wastebasket styles available. 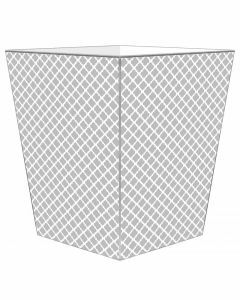 The 11" Square wastebasket with a flat top , 11" Square wastebasket with a scalloped top or 12'' tin fluted wastebasket. There is also a coordinating tissue box available for an additional price. Please make the selections in the drop down menu below. Please note all items are custom made and may not be returned. The size specifications for each item are shown in the pictures. All items are handmade in the USA and the production time is approximately 2-3 weeks. Please refer to our Return Policy on custom items. Click on images for greater detail.